【Headband and Headphones 2 in 1】 Bluetooth Kids headphones headband allows kids to listen to music without having to wear additional headphones, and protect you from being disturbed by your mess hair and sweat. Make your kids focus their own things. Built-in microphone won\'t miss any callings from parents.It is the best earphone for kids travel and back to school.Notice: Please press the middle button to power on or off in case of the bluetooth module is not in the right position. 【Bluetooth 4.2 Stereo Sound with Thin Speaker】 Thickness is only one-third of the average speaker, which is very comfortable for kids. True HD high fidelity sound featuring latest Bluetooth 4.2 technology that produce great sound quality, bluetooth can pair any smartphones or tablets easily. It is the best gift for kids for festivals such as Christmas. 【Play Time Last 8 Hour】 With Upgrade 200mAh high-performance chargeable battery and upgrade charging port, Charge 2-2.5 hours provide more than 8 hours playing time, make kids enjoying a whole day! How to connect Bluetooth: 1.disconnect all bluetooth in the phone or tablet. 2. long press the middle \"on/off\" button to red/blue light flash. 3.Find \"BT-FAAH\" in the bluetooth list and connect. Notice: It can\'t connect to 2 devices at the same time. 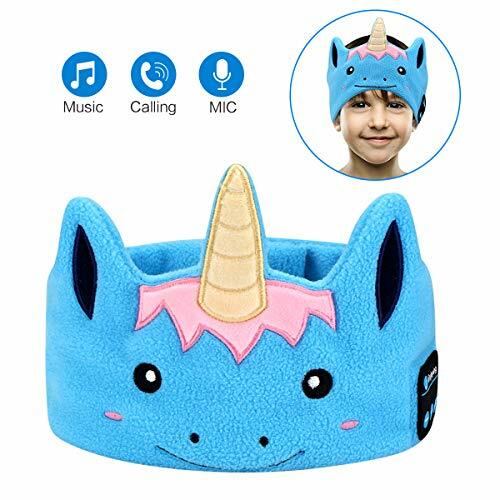 【Unique Design and Washable】The pattern is most popular in kids, music bluetooth headband is made of 100% polyester,and provide a soft and comfortable feeling, foldable, and easy to carry. Fabric liner separated from stitching is not defective,it is the place to take out the bluetooth module, so you can full wash the headband. 【Size and Speakers Adjustable】Size is 7.8-9.8 inch, fit most girls and boys, the delicate wiring connected to the speakers that go from ear to ear is very sturdy, you can adjust adjust the position of the speakers for your ears to hear more clearly.